Multiple scientific names have been given to the Przewalski’s horse by different authorities. Some consider it a subspecies of the domestic horse’s evolutionary lineage, while others consider both Przewalski’s and domestic horses as subspecies of a wild progenitor. A third opinion holds that Przewalski’s and domestic horses are survivors of two separate lineages that diverged long before horses were domesticated. Recent genome sequencing studies of modern Przewalski’s horses, domestic horses, and ancient horse samples as old as 700,000 years support this third theory. Przewalski’s horses were first described scientifically in 1881, and captive breeding began in the early years of the 20th century. By the 1960s, the species was on the verge of extinction in the wild. While the exact date of the extinction of the wild population is not known, the species owes its survival to the breeding efforts of zoos worldwide. The species has now been reintroduced to the wild at multiple sites in Mongolia, China, and Kazakhstan. In 1969, we had our first Przwalski’s horse birth at the San Diego Zoo. Soon thereafter, a herd was established at the San Diego Zoo Safari Park, where most breeding has taken place. Together with our partners, San Diego Zoo Global curators and scientists in our Conservation Genetics team organized a cooperative breeding program designed to conserve genetic variation and reduce inbreeding. The historic exchange of Przewalski’s horses between US zoos and the former Soviet Union in 1982 led to collaborative studies that provided information to correct the pedigree record for the species. Today, zoo-based efforts to conserve Przewalski’s horses have grown into a global management program that continues to provide horses for release into wild reserves. 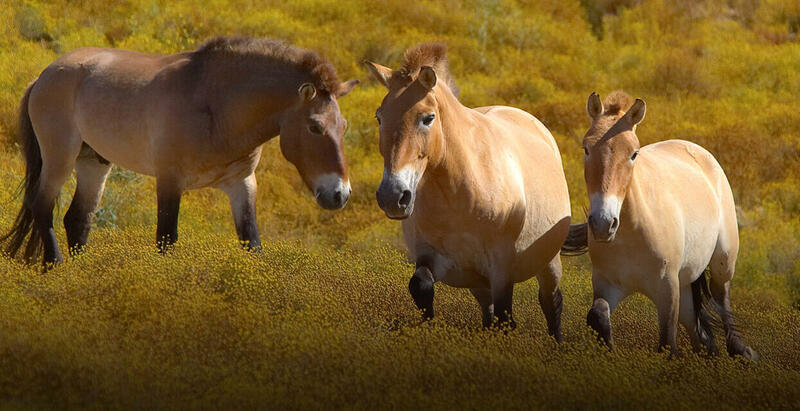 Over 157 Przewalski’s horses have been born at the San Diego Zoo and Safari Park and their offspring have been sent to zoos and reintroduction projects around the world.